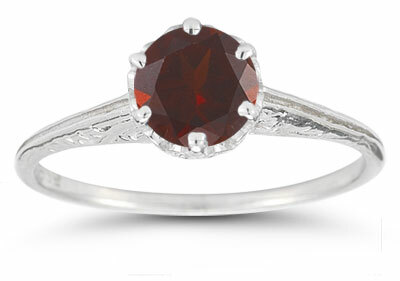 The Victorian romance is seeing scarlet again with this garnet gemstone ring from Apples of Gold. A single scarlet gem of garnet is round cut and placed center stage in this piece for a stunning style. The gem is supported by a silver setting that not only secures the garnet, but also displays it above the band with chic Victorian flair. The band, also of silver, features small engraving to continue this lovely period style and complete the ring's look. Also available in 14K White Gold (shown below). We guarantee our Vintage Prong-Set Garnet Ring in Sterling Silver to be high quality, authentic jewelry, as described above.